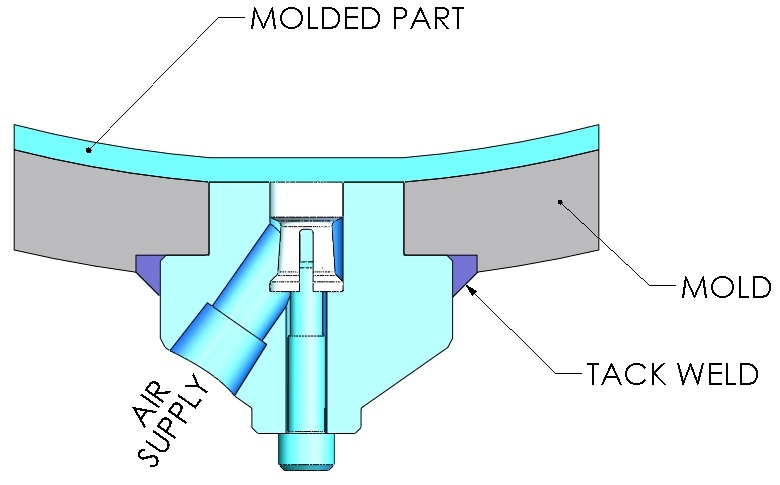 David Wolfe Design Roto-Poppet ("RP") Inserts are used when there is a need to assist in the removal of the already rotationally molded plastic part from the mold by introducing positive air pressure between the molded part and the mold cavity during de-mold. DWD "RP" Inserts are made from M-1 aluminum and are to be used in conjunction with DWD "SL" Series Air Poppets sold separately. DWD “RP” Inserts have been designed to be installed in an area of the mold with a nominal thickness of 3/8”. This may be achieved by either spotfacing or building up the backside of the mold as necessary. A nominal 1” hole then needs to be bored through the mold shell. The “RP” Insert should then be installed from the back side of the mold and welded in place. Install the DWD “SL” Series Air Poppet from the face of the mold securing with the supplied SHCS. Plumb the air supply to the 1/8” NPT port on the back of the Insert.